Ricky has twelve consecutive Grammy-nominated albums, all from his own Skaggs Family Records label. In 1982, he was made the youngest member of the Grand Ole Opry at the time. He made his television debut at the age of 7, performing with bluegrass legends Lester Flatt and Earl Scruggs on their popular syndicated television show and earning his first paycheck ever for a musical performance. At 15, Ricky became a member of bluegrass legend Ralph Stanley's backing band, The Clinch Mountain Boys. Ricky and his ace backing band, Kentucky Thunder, have won 8 Instrumental Group of the Year awards from the IBMA. He has had 12 #1 singles on the Billboard Country charts and 12 Top 20 Country albums. Ricky collaborated with the Raconteurs and Ashley Monroe on a Bluegrass-inspired version of the Raconteurs track "Old Enough." 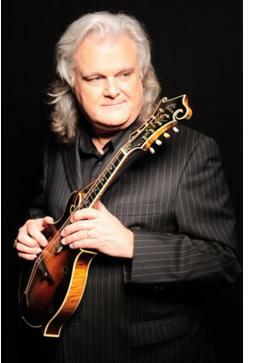 His album, Ricky Skaggs Solo: Songs My Dad Loved, released in 2009, was nominated in the Best Traditional Folk Album category for the 2010 GRAMMY awards. Ricky played all of the notes and sang all of the songs on this project. Solo is a musical tribute to the man who caused him to fall in love with music—his father. Ricky Skaggs' album, Mosaic, is a return to a full band sound that mixes elements of Country music with Beatles-esque melody and lyrics that speak to Skaggs' faith, making "music that is in my head and in my heart," as Ricky says. It was co-produced by Grammy winning songwriter/producer Gordon Kennedy. In 2010, Mosaic was nominated for two GRAMMY's in Best Pop/Contemporary Gospel Album & Best Gospel Song categories (for "Return to Sender"). In stores on July 19, Ricky Skaggs' Country Hits Bluegrass Style is a mix of his #1 hits and fan favorites mixed with his country and bluegrass roots. He is sharing this music with fans around the country on his current Treasure Chest Tour. Thirty-two bands will be performing on 3 stages including headliners: Ricky Skaggs & Kentucky Thunder, Doyle Lawson & Quicksilver, Sierra Hull & Highway 111, Blue Highway, and John Berry. A live auction on the Main Stage featuring acoustic string instruments crafted by master luthiers of the Appalachian Region. Camp Houston will be a unique area dedicated to youth music, workshops, jam sessions, and other activities focusing on continuing the musical tradition of the region. Musicians are encouraged to bring their instruments and join in on jam sessions in the Park. Instrument Appraisals by recognized masters in the field of music. Silent Auction featuring a variety of musical and non-musical items. Antique firefighting equipment display honoring the 100th anniversary of the Galax Volunteer Fire Department. A limited number of camp sites are available by reservation (276-236-9908). Showcases featuring Jon Lohman, Virginia State Folklorist and VFH Folklife Program Director along with master musicians in Bluegrass and Old-Time Music. Arts & crafts of the Appalachian Region featuring members of the Chestnut Creek School of the Arts (CCSA). HoustonFest's mission is to honor Houston Caldwell's spirit and legacy by transforming lives through the power of music and community service, to provide inspiration and avenues for regional youth to pursue their artistic endeavors preserving the musical heritage of this region, and to provide support to the Galax Volunteer Fire Department. HoustonFest was recognized by the Blue Ridge Travel Association of Virginia as the "Best New Event of the Year, 2011". For more information go to HoustonFest's official website at www.HoustonFestGalax.com. Money saving advanced tickets can be purchased at www.HoustonFestGalax.com; by phone at 276-236-9908; at all Grayson National Bank locations; and in Galax at The Leaf & String, Roy's Diamond Center, Barr's Fiddle Shop, or the Galax Visitor's Center.